We are excited to announce that The TugCam™ from Netarus was featured in an article in Professional Mariner magazine. The article is titled “TugCam’s remote video camera system allows pilots to see what lies ahead” and is in their December/January 2013 edition. Get your copy of Professional Mariner magazine or read more below. When the Norfolk Tug Co. was assigned the job of relocating a couple of three-storytall barges for the U.S. Navy, the company foresaw some potential safety problems. Visibility ahead is always an issue for the crew of a tug pushing barges. But in this case, given the height of the barges, the problem would be acute. From the pilothouse, the crew’s view of the river ahead would be blocked by the tall barges. Norfolk Tug found a solution — a wireless video system called TugCam that effectively allows a tugboat captain to see ahead of the barge he is pushing. 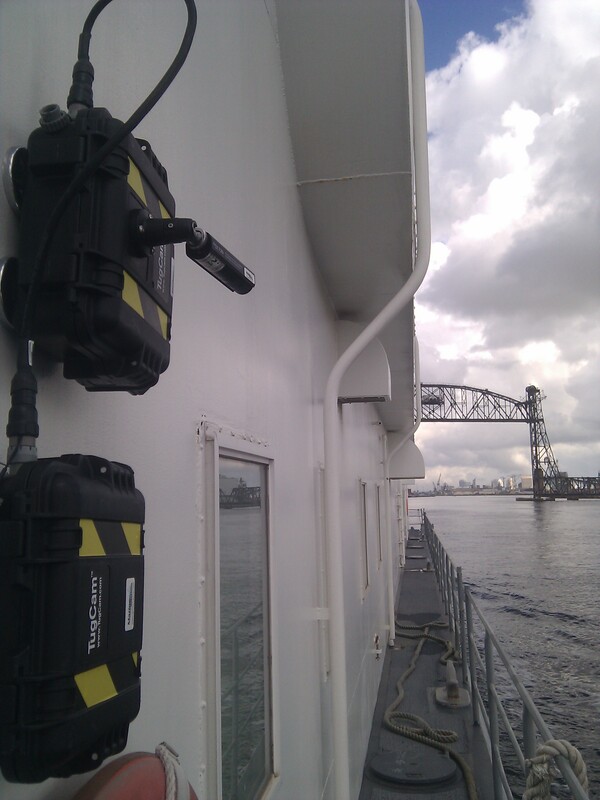 Developed by Netarus, LLC of Norfolk, Virginia, TugCam employs a camera in a magnetically mounted case containing batteries and a transmitter. The camera can be mounted anywhere on a vessel. The wireless receiver in the wheelhouse feeds the TugCam’s remote video camera system allows pilots to see what lies ahead signal from the cameras to any standard video monitor. second experience with the TugCam, and he sees the value in giving the operator a better view. Show. Prices start at $4,500 for a basic platform that includes the camera module, batteries and the wireless transmitter and receiver but not a display, said Chris Machut, chief technology officer for Netarus. Users can select options such as multiple cameras, digital video recorders (DVR) and thermal or nightvision cameras as well. on the James between Norfolk and Richmond. “Sometimes the barge is going out into the turn before the wheelhouse reaches the turn,” Machut said. Machut said the TugCam offers flexibility to meet a tug operator’s operational requirements. A tug operator can install displays on each vessel and then deploy the camera unit where it’s needed. Or each tug could have a unit installed. There’s also a portable display option to make the entire unit portable and easy to set up on any vessel. have,” he said. From his experience with sea trials of the TugCam, McCrory thinks the addition of video cameras to the wheelhouse will be a good thing for tug operators. “It’s going to give you another tool to keep a proper lookout and I don’t think it will distract you in the wheelhouse if it’s used properly,” he said. Pick up your copy of Professional Mariner from http://www.professionalmariner.com.